The history of Japan's martial traditions is replete with many outstanding individuals, but few ever attained the legendary status of Morihei Ueshiba. Throughout his extraordinary life, he mastered an array of martial arts and techniques, including jujutsu and kendo, and endlessly devoted himself to the philosophies of Japan's martial schools. He also had a deep knowledge of the practice of Shinto. Refining these traditions into a wholly new system, he founded Aikido - the way of harmony.Going far beyond simple methods of attack or self-defense, Aikido seeks to dispel any aggression through harmony, thus ultimately promoting peace. Through its unique aspect of both preserving the heritage of the classical fighting arts and applying them within the context of contemporary society, Aikido has quickly become one of the most respected martial arts in the world. 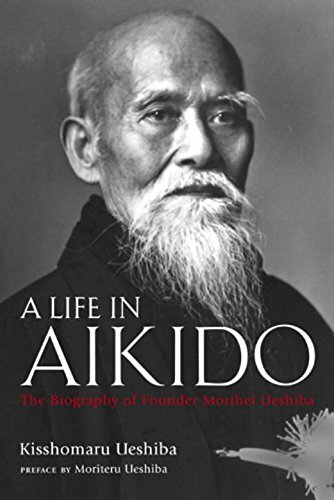 In this engaging and compelling biography, the Founder's son Kissomaru Ueshiba details the life of this remarkable man, from his early years as a youth in the turbulent Meiji era to his death in 1969. Incorporating many first-hand accounts and anecdotes with historical documents, the author weaves a fascinating narrative of the Founder's life, and with great fondness tells of his own memories of the man who would come to be known as O Sensei - great teacher.This is an authoritative biography of the founder of Aikido, published for the first time in English. The author is the second Aikido Doshu and the son of Morihei Ueshiba - the potential audience is vast, as the author is internationally renowned as a martial arts grand master. It is extensively researched by the author, who interviewed key figures in his father's life and visited many of the places, waiting 30 years before releasing his work. The preface is by Moriteru Ueshiba, third Aikido Doshu and grandson of Morihei Ueshiba.